Headliner Porcelain Raft, aka Mauro Remiddi, capped off the night at the Drake with celebratory spirit. He performed alongside a live drummer who used both a regular and electric kit to produce stadium-sized percussion that flooded the club from the dancefloor to the bar. Meanwhile, Remiddi played electric guitar and sang, intermittently manipulating a table full of knobs, pedals and a sampler keyboard. The end result was alternatively euphoric and cathartic, and Remiddi gave off the sense that he could get a crowd to raise their lighters in the air or start a rave, depending on his mood. Unlike earlier performer Mac DeMarco, the show was not overtly comedic, but was still a lot of fun. 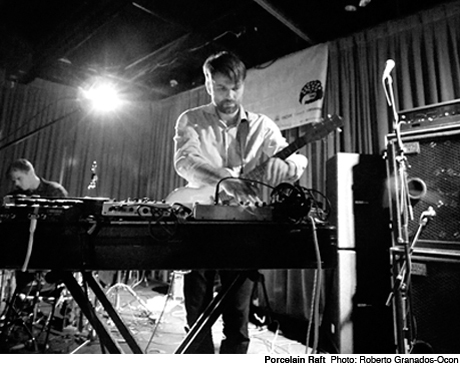 This gig was the last stop on a five-month tour for Porcelain Raft, and it ended with a concise and direct version of "Unless You Speak from the Heart," a single from his excellent debut Strange Weekend.